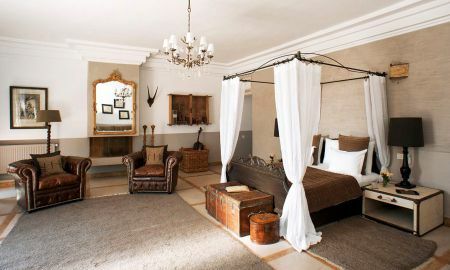 Dar Nanka is decorated in a beautiful fusion of East and West with Art Deco touches. 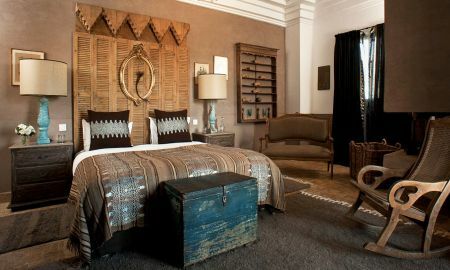 Decor is elegant yet rustic, featuring fireplaces, chandeliers and fine textiles. The hotel offers an outdoor swimming pool and air-conditioned accommodations with contemporary décor. A free shuttle service is also provided. Free Wi-Fi access and a flat-screen TV with DVD player are provided in all accommodations. Each is spacious and includes an iPod docking station and a private bathroom. Breakfast is offered every morning and snacks are available from the poolside bar. The on-site restaurant serves a range of international dishes in the evening. Staff are available 24 hours and can help arrange tours and excursions. Dar Nanka also runs cooking classes. Free private parking is available. 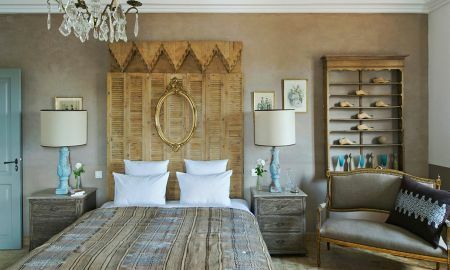 Dar Nanka is situated in lush gardens, just a 15-minutes drive from central Marrakech. Jamaâ El Fna, with its traditional markets is 9 km from the guest house. Marrakech-Menara Airport is 8 km away.